A photo of a statue at the MBTA Central Station in Lynn. I really like this statue. Clearly, we know that part of the reason is that I'm a shameless bibliophile. Of course, I also teach literature at North Shore Community College, which is right across the street from this statue. But I love what the statue communicates. The person sits upon a throne of books. They hold him up and indeed, when you look close enough, they even are a part of him. In fact, it's hard to tell where the books end and the person begins. It's a great metaphor about books and by proxy, learning. I find it also fascinating that the person is largely naked--speaking to how deeply books become a part of us--surpassing the exterior and delving into our private world. 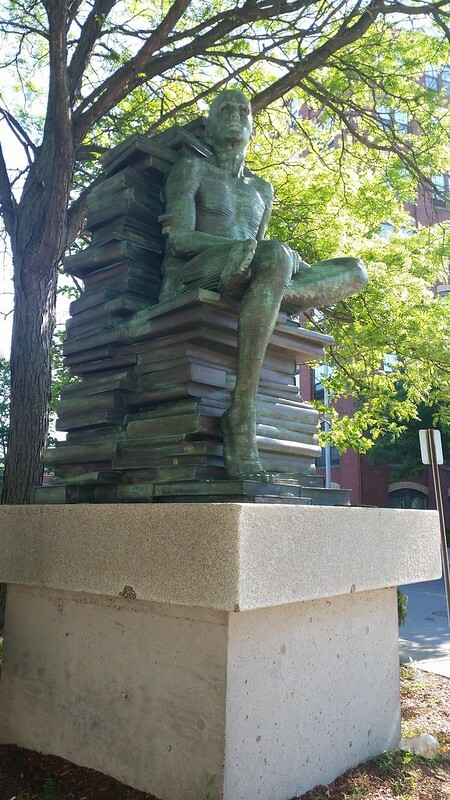 I look at this statue and I regularly wonder--which books are they that make up this person.